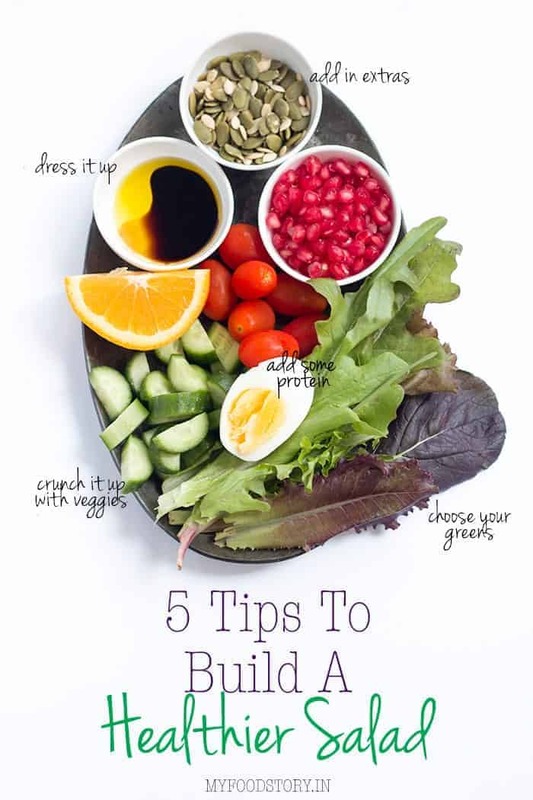 Learn how to build a healthier, tastier salad with five quick tips. Use this guide to make your salads low-calorie, nutritious and more flavorful. Just because this is my second vegetarian post in a row, it doesn’t mean I’m turning into one. As much as I love my veggies, not in the least bit tempted. But when you receive a gorgeous bagful of greens from your favorite zero pesticide farm company, you make your salad and eat it too. The problem with salads is that, if not done right, they can be deceptively high on calories. And most salads you eat at restaurants, drenched in cloyingly, thick dressings probably are. You’d be surprised that a Cobb’s Salad, however delicious, can set you back by as many as 700-800 calories. So today, I’m going to give you my quick tips on how to build a healthier salad. It’s important to choose the right greens. While it may be tempting to reach out for the popular ice berg, try a darker lettuce instead, like the Oak Leaf or Romaine. Mix things up with some spinach or even kale. These will help build a good base for your salads, and get lots of fiber into your system. The best part – lettuce has very few calories; as low as 10 calories per cup, and are great sources of vitamin A and potassium. Add some color and crunch to your salad with lots of vegetables. Cucumbers, capsicum, tomatoes, broccoli, carrots and peas are great additions. Just make sure they are either raw or steamed. No frying please. We sometimes forget how important protein is for us. Carbs just taste so good, don’t they? Salads are a great way to amp up the protein. If you are vegetarian, choose between tofu, cottage cheese or even kidney beans and chickpeas. Otherwise there is always chicken, fish and eggs. If you are choosing meat, make sure you stick to the lean varieties and have them boiled or poached. Extras like fruits, nuts or seeds can add more flavor and crunch to your salad. I love adding walnuts, almonds, oranges, pomegranate or even pumpkin seeds to my salads. You could even sprinkle a small portion of goat cheese or feta if you are feeling particularly fancy. But remember, a little goes a long way. My Apple Walnut Summer Salad is a regular at home. Now this is where it get’s tricky. Up until now, you were building a wholesome, flavorful and nutritious salad. But if you are going to douse your salad in creamy dressings like mayonnaise or ranch, you just undid everything. Stick to lighter dressings like mustard, lemon or balsamic vinaigrettes or even a squirt of lemon juice with some olive oil. I have three great salad dressings for you. Now that we’ve listed down the 5 commandments of building a healthier salad, go get started! Connect with me on Facebook and Twitter if you are looking for salad recipes or healthy eating ideas. Look out for my favorite salad recipe in the next post! Haha totally Howie! My husband detests an all veggie salad. Wow, that’s great piece of trivia. I had no idea that a vinaigrette can help with digestion. I’ll keep that in mind. Good post! I used to forgo the dressing or get it on the side (just in case). Then I learned that vinegar and oil dressing actually helps you digest the salad better and absorb the nutrients. So now I am learning to make better vinegar based dressings! Get some good vinegar, not the stuff from the grocery store- the taste difference is amazing! We eat so many salads in the summer. It’s too hot to cook or bake anything, so we turn to cold, crisp veggies. This will help me put together some new salads and keep some variety. Thanks for posting! I love grains in my salad too. Just makes it so wholesome and a full meal. Great ideas. I would add just a 1/4 cup of grains/seeds like quinoa or brown rice. I love the photo, it’s an excellent illustration! This is pretty much the way I build my salads too. I LOVE crunch in my salad! Always lots of fresh raw veggies, nuts and seeds! We have different greens growing like crazy in our garden, so fresh salad is always on the menu! Love making salads! Great tips! Thanks for sharing! Totally, especially when it’s so hot, salads can be so refreshing. I know what you mean. There are days when you just don’t care. Great formula here for making a killer salad! Especially timely with all the yummy summer veggies we have right now here; combined with the hot weather, I just want to eat more salads! Thanks for the ideas! Thanks for this post. Salads are one of my favorite meals. I don’t kid myself about the calorie content! Sometimes I go all out with creamy dressings; other times, I’m more calorie-conscious and use fresh lemon and a drizzle of high-quality olive oil. I find that salt and pepper are key too — especially if you’re omitting the (delicious!) creamy dressing! Looking forward to your next recipe! Thanks Kirsten! I am the same way 😀 I love my dressing on the side, or a little drizzled on top. Richa, loved your composed salad! Pinning! This photo is terrific–what a great choice to showcase this post! We get a big bag of salad greens from our farm share, and adding some protein–usually chick peas, some cheese, some crunchy–often radishes, and all the veggies we can use up. My spouse doesn’t like any dressing at all, but I like a bit on the side.